4CraftyChicksChallenge -- Metal. Thinking of You is the title and sentiment on my card. 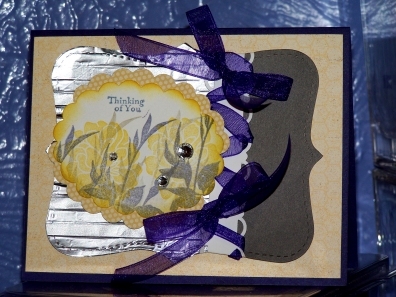 I just love these silhouette flowers from Stampin' Up! set Fabulous Florets. I stamped in Sahara Sand and Wisteria Wonder. My "METAL" element is aluminum foil run through my Big Shot with the Top Note Die and the Stripes ef. I punched the white with my Scallop Border punch and then I laced my ribbon through it and tied a bow at each end. Added some rhinestones to the flowers and called it a day. Loving your take on the metal! Great inspiration and a beautiful card. Thank you so much for sharing it with us at 4 Crafty Chicks. Nicely done our Metal Challenge at 4 Crafty Chicks, thanks for playing! TFS!